These demands reflect a belief that, if they’re met, the decline in the number of people playing squash in England actually can be halted. Although there isn’t space on this blog to explore the world-view that this belief reflects, one thing is certain. The issue of squash participation in a world of dynamic social change, economic uncertainty and cultural diversity is a complex one. And, to address it successfully, new forms of leadership will need to appear. To understand why, it’s worth looking at the nature of leadership in complex situations, and at the kind of actions needed if squash is to evolve and occupy the most hospitable socio-economic niches, not just in England but across the world. Whatever else it is, leadership is about making sense: of social environments and trends; of human behaviour; of cultures; and of situations, current and emergent. Without effective sense-making, it’s not even possible to make effective decisions. And without effective decisions, squash – along with every other sport – can’t respond quickly enough to changes in the complex environments within which it’s competing with other forms of activity. Fortunately, recent research has led to a deeper understanding of the dynamic nature of social environments. It’s also led to the emergence of some tools which can help people to make sense of the fast-changing situations in which they find themselves, and respond in the most effective way. One of these tools, a sense-making framework created by Welsh researcher Dave Snowden, is shown below. Snowden’s framework is used in a wide range of contexts by governments and organisations all over the world. Its purpose is to help decision-makers quickly assess dynamic situations and decide the most appropriate courses of action in responding to them. It also helps them to learn how the social groupings and networks around them are changing by monitoring real-time information fed to them by their members. 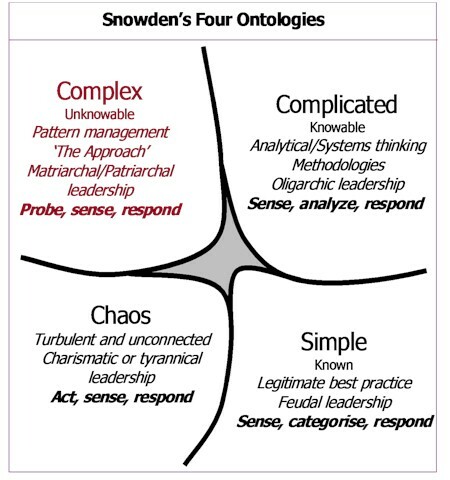 The framework comprises four ontologies or domains – simple, complicated, complex and chaotic – which can be used to understand and assess current situations. Of course, all of us have different world-views, experience and sensitivities, and so a situation which is complex or chaotic to one decision-maker may appear to be simple to another. With this in mind, it should be obvious that the framework isn’t a static collection of ‘pigeon holes’ for categorising situations or problems; it’s a dynamic tool for leading conversations, seeking consensus and agreeing actions. When looking at the framework, it’s wise to remember that leadership isn’t just a skills-based capability which is, or even can be, possessed solely by the occupants of certain positions of authority. It’s a state which any individual is capable of attaining, often at times and in circumstances when they most need to – or when others most need them to. And leadership takes many forms. In simple situations, our beliefs are based on a strong assumption of order and of certainty that specific actions will lead to predictable and consistent outcomes. When we live in simplicity, we tend to categorise or ‘pigeon-hole’ the situations we’re in and then respond to them in tried and tested ways. Leadership in simplicity rests on ensuring that reliable methods are in place: methods for performing routine activities; for monitoring for complacency (sloppiness); and for detecting early signs that methods need to be changed. This kind of leadership is often referred to as ‘bureaucratic’ or ‘feudal’ leadership, and is suited to the maintenance and improvement of controlled processes operating within stable environments. In complicated situations, we sense that we’re dealing with issues which, although not well-understood, can be understood by experts. As with simple situations, we assume that complicated situations are ordered in some way and that we can forecast outcomes. But we also see that the same outcome can arise after taking different courses of action. So, we accept that we’ll have to analyse each situation before we decide how to respond to it in the most appropriate way. This approach requires systems thinking and typically leads to the development of good practice approaches (also known as methodologies) for analysing similar situations and deciding bespoke courses of action. Depending on the nature of the situation, we typically seek the help of experts to support us in navigating through the different methods and courses of action available to us. Leadership in complication rests on ensuring that the right people and practices are brought together at the right time to analyse and respond to situations. Courses of action are typically planned and carried out in the form of structured projects with feedback being used to monitor progress and change direction, if necessary. This kind of leadership is detached, yet sensitive to deadlines and any issues and risks arising. It’s often referred to as oligarchic leadership in that power over what courses of action are to be taken rests with a small number of expert-advised people. Living in complication involves a constant search for what we believe are the right experts. However, there’s a risk in always believing the opinions of experts. As they compete amongst themselves, experts are sometimes prone to believe in their own infallibility, descend into group-think and adhere to outdated and inappropriate approaches. And in complex or chaotic situations, this can prove disastrous. In complex situations, we sense that we’re dealing with unordered scenarios. We don’t understand what’s happening but we sense that it’s possible to find out. We sense or see coherent patterns of behaviour, but they don’t seem to repeat for any length of time. There appear to be constraints in the system, but if we try to impose rules, people break, ignore or circumvent them. What’s more, any evidence we can find to tell us what’s happening supports multiple, contradictory positions. Leadership in complexity rests on continuously probing social environments for meaningful narrative information using multiple safe to fail experiments. We know that some of these short, sharp probes will provide new insights into what people are thinking and feeling which can be used to support effective decision-making. Other probes won’t. To support continuous communication with different social groupings, we acquire the habit of routinely asking for, collecting and responding to rapid feedback about what we’re facing and what we’re thinking of doing. This leads us to the creation of human sensor networks using approaches such as the stimulation of social networks using social media. We try to make sure that our networks are as diverse as possible since people of different ages and from different backgrounds tend to give us different perspectives. This helps us to design different kinds of safe to fail probes. Leadership in complexity tends to be patriarchal or matriarchal in nature as it is heavily dependent on openness, trust and reciprocity. If openness and trust are lost, they are often impossible to regain. In chaotic situations, we sense that we’re dealing with turbulent, unordered scenarios in which it’s impossible to understand what’s happening. We don’t sense or see any repeating patterns of activity and, unlike complex situations, there’s no evidence of any constraints in the system. Everything seems to be in a state of permanent transition. Things that we once took for granted no longer apply. Leadership in chaos rests on fast, authoritative action. We are in crisis and there’s no time to be reasonable. Decisions have to be made and stuck to; going back on them will risk further turbulence and uncertainty. Yet, as we take action, opportunities to reduce turbulence and to innovate begin to appear like shadows in fog. Effective preparation for leadership in chaos depends heavily on the presence of pre-existing human sensor networks. Not only can these provide immediate feedback in response to requests for information, they can act as a source of members for crews, groups of conscripts who can be rapidly organised to stabilise specific situations. And, as in complex situations, the more diverse the feedback the better. Leadership in chaos is, by necessity, tyrannical. The power to direct actions must be seized if it is not already held. Time is of the essence. Some tyrants, of course, are charismatic. However, charisma alone does not guarantee leadership effectiveness. A closer look at Snowden’s framework reveals a fifth domain. The domain of Disorder separates the other four, snaking like an abyss between them. It represents leadership paralysis and inaction, the state of not sensing which of the other four domains most accurately describes a situation. The abyss is at its deepest between the Simple and Chaos domains. 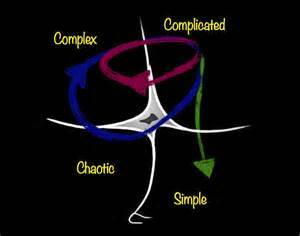 Simple situations, if not continuously assessed in the light of new knowledge, can suddenly descend into Chaos. Old habits can die hard. As little time as possible should be spent in the domain of Disorder. Better to cycle through the other four until one is found which feels the closest to current reality. And that’s the value of Snowden’s framework, along with others which have been developed over recent years. Leadership needs to be felt rather than just done. Different ‘states of reality’ demand different forms of leadership. And without the ability to sense those states and respond appropriately, leadership cannot survive, let alone serve the evolution of squash. In the next post, I’ll look at the role of culture in shaping leadership. Thanks to Squash Mad for its post “England Squash suffer budget slash and are threatened with further action unless new objectives are met” on January 25th, 2014. “The new dynamics of strategy: Sense-making in a complex and complicated world” by Cynthia Kurtz and Dave Snowden is published in the IBM Systems Journal, Volume 42, No 3, 2003.